I love perogies! They are pretty much the perfect food. Noodles on the outside, creamy potatoes on the inside with flavours of onion, cheese, bacon, or pretty much anything you want to put in them. 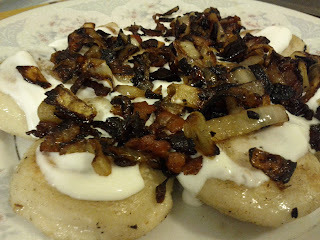 The best way to eat them is in a dish I like to call the Polish Poutine: Fried perogies topped with loads of sour cream, crispy bacon, deeply caramelized onions and fresh ground black pepper. My heart beats faster every time I think about it. I'm not sure if it from pleasure or palpitations. This is an incredibly satisfying meal in itself. Sometimes I add spinach, cilantro and/or peas to it just to get some green in there. I made an actual perogie poutine with squeaky curd cheese and rich gravy, but after the first bite novelty wore off it wasn't so great. You don't really need anything else, but if you don't want to feel like a sac of potatoes yourself, make part of your meal a salad. 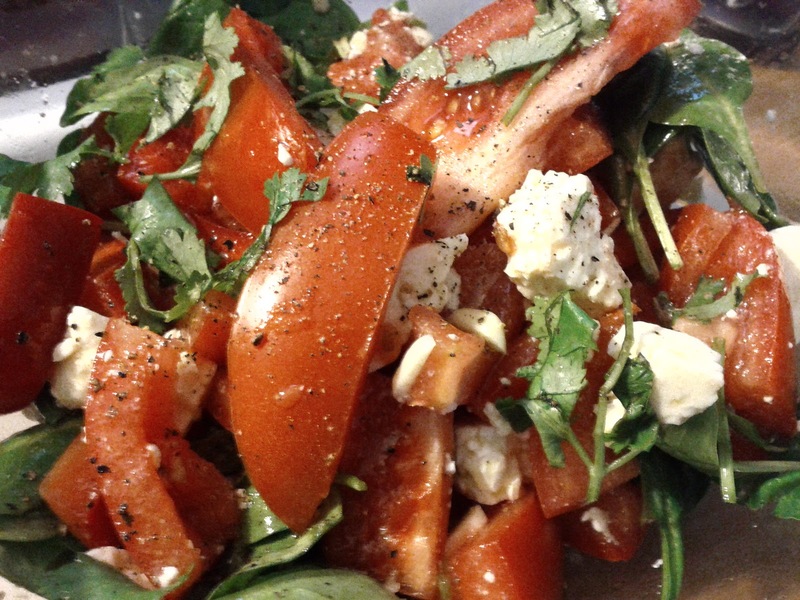 I know, you don't make friends with salad, but luckily I already have lots of friends. So, here it is. A salad of baby spinach; tomatoes; feta; cilantro; black pepper; and a light homemade dressing of olive oil, cider vinegar and orange ponzu (flavoured soy sauce). I love avocado in this salad, but I didn't have a ripe one today. Asparagus is also quite nice. Very refreshing.